Want to get an ultimate, rich-sounding bass output from your truck stereo? 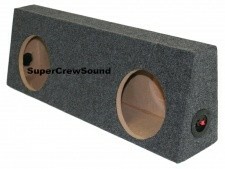 If so, add our A-grade subwoofer enclosure to your sound system. We are an undisputed leader in selling the best Nissan Frontier truck bed and other accessories in the United States. We have an impressive range of subwoofer boxes to give that extra kick to your sound system it has been missing. Our subwoofer boxes come with many splendid features like Superior Quality MDF, attractive finish, and precision manufacturing. It does not matter what kind of music you like, our wonderful Nissan Frontier sub box is sure to enhance your audio experience. Our entire range of Nissan Frontier subwoofer boxes has been designed to deliver loud, boomy bass along with an extra punch & reverberance. Its great sound output will definitely make your ride a pleasant experience. As we build all our subwoofer boxes to order, we request you to share your particular needs with us while placing the order. We offer you to choose from multiple cutout size options, mounting depths, and carpet colors. In case you want to have a non-standard hole size in your Nissan Frontier subwoofer box, we will happily customize it for free. To know more about any of the products listed above, give us a call at (877) 424 0979.